Can you imagine the questions they asked themselves as they raced back to Jerusalem? The distance was probably 7 miles. Do you think they got competitive about who recognized him first? They shared the same physical experience of feeling the truth in their hearts, hearing it and being in his presence. They were overcome with the need to do something about this experience, to share it with everyone else. It was late in the evening, yet they jumped up and hurried back to their friends (hours away). Once gathered with their friends the experience they had just had was confirmed by others who had also seen the risen Lord. 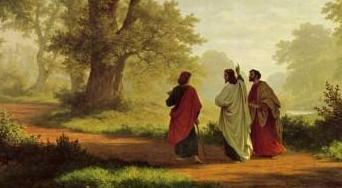 When I think about the Road to Emmaus story it reminds me to always think about which direction I’m heading today. There are choices to make. Too frequently I’m heading back home to what’s familiar and comfortable, my tail between my legs. I fall into ruts and routines and am not as intentional with people like I want to be. Today, I want to be with those two disciples whose hearts were filled with happiness and hope, eager to get back to the scene of all the action. I want to live a life that reports the truth and not dwell on fear and failure. Our life is different than it was for those two disciples heading home that day. As believers we have the Spirit residing within us. We have not been left alone. So why do we still have such trouble recognizing the presence of God when he resides so close to us (within us)? How much nearer does he need to get? Maybe the noise of world is too much with us. It’s not looking for God…Are you? Be certain today that you’re running back to the action not back home to safety. Listen for that voice in your spirit who’s there to guide your steps into the will of God. What looks like defeat may indeed be the greatest triumph. Thank you for the reminder. Good question we all have…Paul addressed it in Romans 5:3-5…problems help us to learn….that’s the opportunity of life in Him.